Well, that was fun! And, on the whole, the Extra-Life community raised nearly $1.9 million! That’s incredible! Thanks to everyone that was involved – either by participating, donating, or simply showing up and keeping us company while we made it through. Special thanks to Liore for a) talking me in to doing this and b) providing someone to talk to at various hours of the night. I actually was surprised at how easy it was to stay up for 24 hours straight. I did take several breaks, to rest my eyes/stretch my legs/etc, and I think that helped a lot. I had originally planned for no caffeine, but that plan sort of went to hell at around 2am. Whatever, it ended up okay. I think the worst hours were the last two, and part of that was probably just due to the fact that I came back to Rift to do some fairly generic quests for reputation-building purposes. Maybe the quests weren’t generic, but they certainly weren’t as engaging as some of the games I’d been playing up until that point. So that, combined with the fact that I ran out of coffee – or decided I wasn’t going to have anymore – probably just lined up to cause some issues. Regardless, after only a couple near-deaths from sleep-walking off of cliffs, I finished out the night with a bit of Counter-Strike: Global Offensive. And I did surprisingly well! At least in the Arms Race games I was playing in. Rift ended up filling in a lot of the in-between times. Whether I was just running around doing some quests, doing a little crafting, or feeding inter-dimesional corgis treats to improve their “help sick kids” stamina, I kept coming back and finding something to do. I completely missed getting on to the Storm Legion beta, but I’m not convinced I need to. I’ve already pre-purchased it, really enjoyed what I saw last time, and want to maintain some level of “this is new!” feeling for when I start playing it for real. I do want to help out with bugs and the like, but I still have things that I’m interested in doing on Live, and I just didn’t get to it. Trion was an awesome supporter of Extra-Life, contributing things like special titles for folks that stayed logged in to their servers for 24 hours over the weekend, and special events like the aforementioned Corgi rifts (which rewarded the title “Of House Fluffington”!). I’ve been meaning to return to Ezio Auditore and his exploits for a while, now, and I finally did on Saturday morning. I’m not that deep in, but the game looks great, and I’m really excited to get some more AC in my life. After this one, I have AC: Revelations, and AC3 is out at the end of the month, and should be great fun. It was actually Liore’s streaming of the start of AC2 that made me decide to break this out, so thanks! A couple friends came over to hang out and keep me company in the afternoon, and that was awesome. I’d originally sort of planned to break out a board game or some Magic: The Gathering, but instead we dropped back in to Pandora for some more shooting and looting action. The game is always fun in co-op, and while there are some issues with visibility when playing split-screen, it holds up pretty well. Shout-out to xoanon, here! Liore, Mangle, Kinch and I played some Dungeon Defenders, and it was great! This was only my second session of the game, and it was a ton of fun (again). I’ve waited so long between playing it primarily because it seems awesome to play with 4 players, and I feel like it would be a pretty different game when played solo. Either way, my monk was dropping down auras of electrical doom and confusion, while smashing goblins and ogres with his axe and magic hand-shooty things. And our Squire dropped spinning blades of doom all over the place, which were amazing. I totally look forward to playing this again – definitely glad I picked this up during the last Steam sale. I keep playing Smite whenever I want just a 30-minute game without too much overhead. The same thing happened over the weekend, except that I played terribly (as Ymir, who I’ve seen be a truck, but apparently not under my control), my team was terrible (one person predictably DC’d 3 minutes in), and the other team was pretty solid (at least relative to us). So, whatever. It’s still fun to actually play, even in crushing defeat. I just wish I could have access to more characters than I do without dropping in real money just yet – especially since it remains in beta. But I should probably get over that, since I clearly enjoy the game. I wanted a change of pace, so I broke out one of my old Far Cry save points. Turns out that a) I didn’t remember where I was or why I was there, b) it’s pretty unforgiving, and c) I should have picked it up when I had more patience for being stealthy and deliberate. All in all, I spent 30 minutes or so dying over and over again to mutant gorillas and militia dudes who were more intent on shooting me from across the jungle than the donkey kongs that were eating their faces. So, rather than get frustrated, I gave up and moved on to something else. This was one of the highlights of the night. I’d heard a ton of good things about these games (which are being released as episodic content within the larger game – they are up to 4/5 having been released), but missed the boat on the last sale. Instead, I decided to buy it at full price, and I’m totally okay with having done so. It is an incredibly narrative-focused adventure game, that sort of thows back to some of the point-and-click adventure games that I used to love. Except with great writing, cool characters, and zombies. And also a tonof tension and hard choices. I don’t want to say too much about it, lest I spoil it, but it was really, really good. Episode 1 took about 90 minutes to get through, and made my dark-house coffee runs a lot more interesting later in the night. You should totally play these at some point, even if you wait for all 5 to be released and get the all-in-one version.If you want to see more of what I’m talking about, you can watch my entire playthrough (which I streamed live at the time) here on Twitch.tv. This is a follow-up/sequel/something version of I Wanna Be The Guy, which is just a really brutal platformer. Turns out it is also a ton of fun, and there is basically no coddling at all. In fact, I died 4 times before I even got to level 1-1. Awesome. I don’t want to say too much about it, other than that a) Liore suggested it as part of the Extra Life campaign, b) I started playing about about 5am, c) I finished level 1-1 with just under 400 deaths, and d) it was really, really fun.I guess I am a sucker for the “do this incredibly precise thing and if you mess up at all, you have to start over” genre. 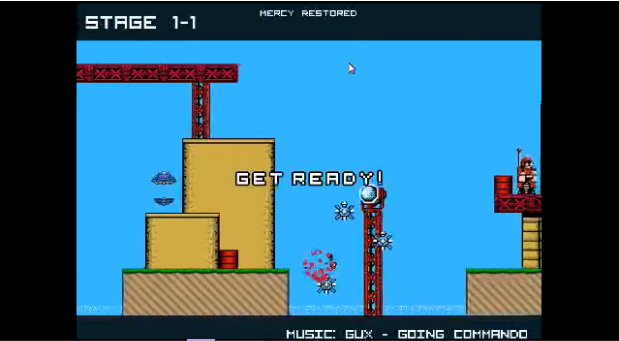 The Trials games and Super Meat Boy seem to scratch that itch for me, too. Even if I can only take them in small chunks. I totally recommend it. Here is a screenshot of me dying before the “Get Ready!” message has even faded out – a not-uncommon occurence. I streamed this one, too. I used to play a ton of Counter-Strike in college. And then I kept playing occasionally afterwards, migrating to CS:Source at some point. CS:GO is the newest installment, and they’ve done a bunch of things to update it, but it’s still CS, at heart. I am still incredibly streaky, and can be anywhere from 25-2 to 0-20 on back-to-back maps. So that’s fun. But they’ve also added the Arms Race mode, which is basically a built-in version of something like Gun Game, and you just get a new weapon every kill. It’s ostensibly a team-based game, but you mostly ignore your teammates and shoot the enemies. So, I guess, a lot like typical casual CS. Either way, it is fun to play, and was a good way to round out my night. So that’s it, really. The run-down on what I played and my thoughts on each of the games. I had a blast, and I definitely intend to participate again next year! 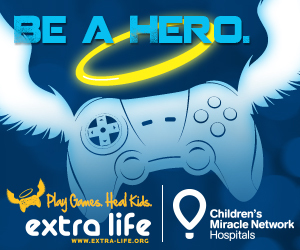 Thanks again to everyone that participated in any way, and special thanks to the folks at Extra-Life.org for making this all happen.